This property is located at 22-23 Sheep Street in Rugby. Check room availability using the search box on your right. The 300 year old Rugby Hotel offers a terrific base to explore Warwickshire and the surrounding attractions of Dunchurch. Guests will find themselves just a couple of miles from Royal Leamington Spa, 15 miles from Warwick Castle and just a twenty-minute drive from Shakespeare Country. The hotel enjoys convenient access to the M1/M6 motorways and Birmingham International Airport and the NEC are just 20 or so miles away too. 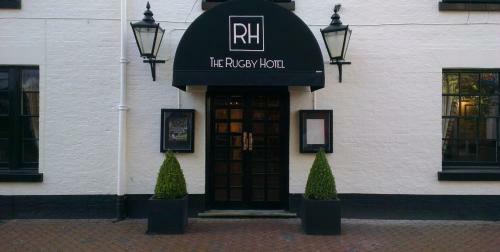 You'll find the hotel in the historic centre of Rugby alongside Rugby School the Rugby Football Museum. Secure and private car parking is available. The hotel boasts a well equipped conference/meeting room ideally suited to your business meeting or private party. The room can be used for small meetings lasting a few hours or booked for whole days for conferences. Full catering is available ranging from simple buffets to hot meals. Though we do not have Spa and Indoor activities on site at The Rugby Hotel, through our strong local relationships, we would be delighted to prearrange these services for you.